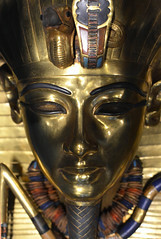 Gathering information and communicating it effectively is the very essence of what the EES does, and several of my previous posts have dealt with the ways in which we communicate with our various audiences (see e.g. ‘A new home(s)’). Ensuring that internal communication at the Society is as effective as possible is another priority of mine and will, I’m sure, be essential if we are to achieve our aims. 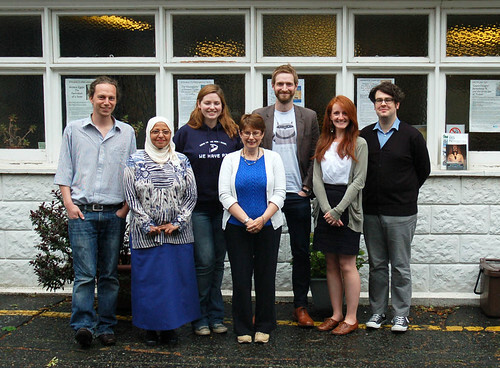 The current EES staff team, L-R: Roo Mitcheson, Faten Saleh, Jo Kyffin, Patricia Spencer, me, Alice Williams and Rob Tamplin. As many of you will already know the Society has been undergoing a period of transition in the last few years. This has on occasion led to some very interesting, you might even say ‘robust’(! ), discussions. These were necessary: in the weeks and months following the withdrawal of the British Academy grant we were forced to ask some very hard questions of the organisation: How can we continue to fund what we do? If we can’t continue in the same way how might we adapt? What opportunities does this offer for us to refine what we do for the 21st century? Often we were forced to make some very difficult choices: should we do X or would it be better for us to do Y? As you might expect those of us who were involved didn’t always see eye to eye on all the issues. Asking these questions meant teasing out what the EES meant to all of us: What does the Society do? What is it for? What could, and indeed should, it be doing in future? Surprisingly perhaps, the answers were not always the same, even among those who had worked together at the Society on the Board, or the staff, or for our field teams. People held different views and often perhaps were not aware that theirs was not the only view. 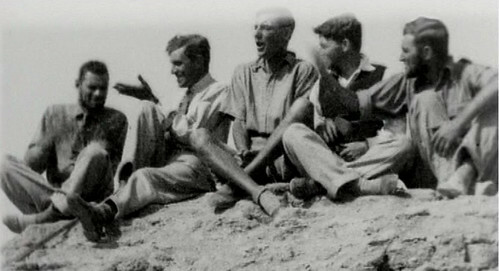 ‘Opinions differ amongst the staff!’: A frame from the 1930s Amarna film (see here) showing a staged argument between the team members – L-R: Stephen Sherman, John Pendlebury, H W Fairman, Ralph Lavers and Hilary Waddington. Perhaps some things never change! With hindsight the lines of communication between all the many people involved were perhaps not always as good as they might have been. We have tried very hard to improve this in the last couple of years and in the last few months in particular. I want to ensure that everyone involved in the organisation is aware of what we are doing now and what our ideas are for the next few years. 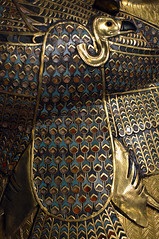 By ‘everyone’ I mean all those with a stake in the organisation: our members and other friends and supporters, and everyone working for us, on the Board, the staff – in London and Cairo – our field teams and the many others who are involved in research projects that are now at the post fieldwork stage. By continuing to improve communications we hope to ensure that everyone has the opportunity play a role in driving the organisation forward and to sign up to what we are trying to achieve, fully aware of what that is. We have made good progress towards this in the last couple of months, with a series of carefully planned initiatives. 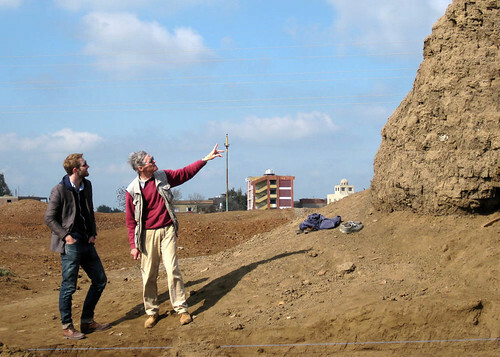 Jeff Spencer showing me the excavations at Kom el Daba. 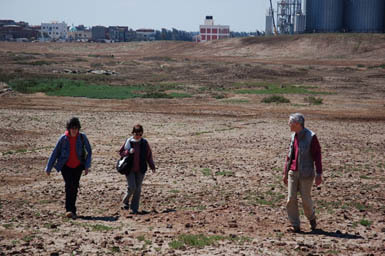 First was my visit to our field teams in March which I wrote about in an earlier post (‘8 Days in Egypt’). While getting to know the teams a bit better I was pleased to see so much so much mixing of expertise from one team to the next: Angus Graham visited Jo Rowland at Quesna for a few days to help with the analysis of some drill core samples (see ‘Stuck in the Mud!’); Reis Omar Farouk lent his archaeological and logistical expertise to both Angus and Jo’s teams this Spring; geologist Ben Pennington transferred from Angus’ team at the end of their season to work with Penny Wilson; and of course Penny, and Jeff and Pat Spencer are long term collaborators on the Society’s Delta Survey, the umbrella under which they are working at their respective sites, and all enjoyed a very productive day field walking at Nashwein this year (see here). I hope that this mixing is helping the emphasise that every member or every one of our field teams is part of the one institution – the EES – and working towards a set of common goals, albeit through different projects, with their own distinct aims. Field walking at Nashwein. L-R: Penny Wilson, Patricia and Jeff Spencer. 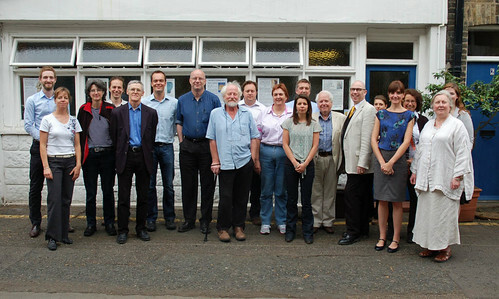 Secondly, at the beginning of this month (June) we gathered the Field Directors together for a meeting at Doughty Mews and took the opportunity to ask them to present the results of their most recent work to a small group of our most generous supporters, and also, the following day, to the Trustees. I have made every effort to ensure that the latter are as well informed of what the organisation is doing as possible; it’s easy to take this for granted but the Trustees are all very busy people with numerous other commitments, and only meet six times a year. There has been a presumption in the past that Trustees will keep abreast of things by all the normal channels – EA, the Newsletter, our website etc. – but in practice this hasn’t always been possible and in any case there is, of course, a great deal to be gained from face-to-face contact. 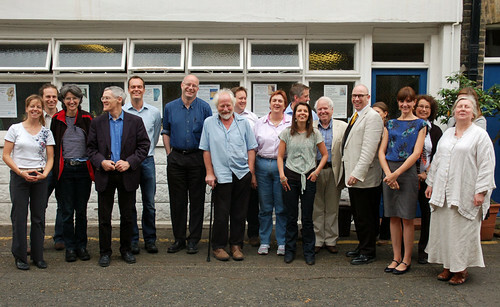 EES staff, Trustees and Field Directors outside the London offices on Doughty Mews. Thirdly, as promised in my earlier post, the Society’s Cairo representative, Faten Saleh, was invited to London for a few days to meet the team in London, to get a better idea of what goes on at Doughty Mews, to discuss improving coordination of activities in London and Cairo, and to attend what turned out to be a very busy and well-received study day on the ‘Grand Designs’ of Amenhotep III, and the launch of Geoffrey Martin’s new volume, The Tomb of Maya and Meryt I. Those members who attended the study day certainly seemed to appreciate having Faten with them: she received a spontaneous round of applause when I pointed her out at the start of the event, and many took the opportunity to introduce themselves to her during the course of the day. We on the staff all enjoyed having Faten with us enormously and I hope that when she returned to Cairo last weekend she had not only gained a broader perspective on the activities of the organisation, but felt more a part of a team. 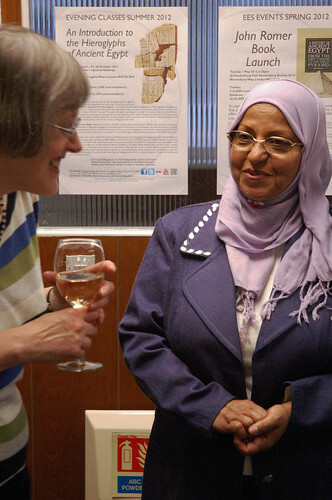 Faten Saleh chats to a member at the launch of Maya and Meryt I. The study day was a particularly satisfying occasion for us: that we had put together a popular event was clear from the number of tickets sold (approximately 200). Our study days are our best attended events and provide a wonderful opportunity for us to enjoy more face-to-face contact, particularly with the membership. 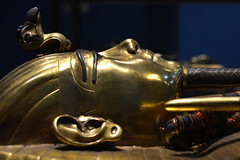 I also felt we had been particularly successful this time in providing a platform for EES research (Angus Graham’s Theban Harbours and Waterscapes Project), and using the other speakers to put that work into a wider context so that the value of the EES contribution to understanding a particular aspect of ancient Egyptian history – the monuments of Amenhotep III in this case – was clear, at the same time providing a well-rounded and appealing day of talks overall. 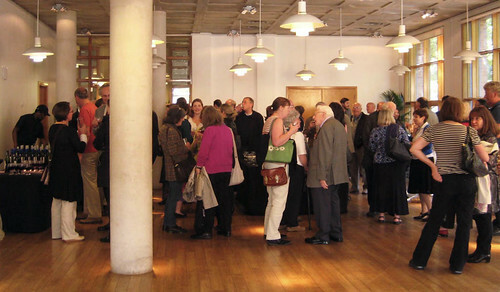 The reception after the ‘Grand Designs’ study day. Photo courtesy of Aidan and Dyan Dodson. I also took the opportunity at this event to invite not just the Field Director, Angus Graham, but also several members of his team, of whom Morag Hunter, Sarah Jones, Aurelia Masson and Marie Millet were able to join us. I wanted to show them how their efforts in the field fit into the wider work of the Society, to bring them closer to the members, staff and others more involved in the UK end of things, and to emphasise their role as part of the wider EES team. 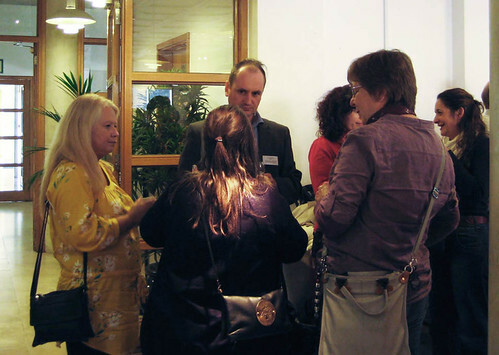 Angus Graham, Aurélia Masson and Marie Millet (both behind the lady with the grey bag) in discussion with members after the study day. Photo courtesy of Aidan and Dyan Dodson. The more we can we can gather people together in the ways that we have in the last few weeks the more effectively we will engender the idea that we are all a part of something, with a shared vision and aims in common, and ensure that everyone feels involved. I want everyone to feel that they are part of a team, to understand what the team is trying to do and what their own role is within that. Bringing everyone together over the last few weeks has been a very rewarding experience. There is a very positive feel about the Society at the moment which seems to be shared by our members, staff, Trustees and field teams, and I like to think that the feeling of being part of a team is something to do with that. If you’re not yet part of the team why not come and join us? EES staff, Trustees and Field Directors share a joke with the cameraman (me! ).